Links: Some of my favorite links. to the health of cats. An international, CFA affiliated club for Tonkinese cat enthusiasts. an invitation to join our club. A Cleveland based all breed cat club. 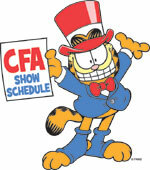 This is one of CFA's oldest show producing member cat club. We put on two shows per year in Parma, Ohio. Champagne Cat Club is our sister club. The Children at The Brenham Community Center in Texas found the website and thought it was an excellent guide for aquiring and owing a cat. I agreed and added the link to my website. Stay-A-While is a no-kill shelter in North Royalton, Ohio. (Just south of Cleveland). This is a great place to get a cat or kitten and by doing so, make room for another one to live in a no kill environment. If you get a chance to visit this shelter, please do so. You will be amazed by the facility, the devoted people who run it and the volunteers who make it special. The Cat Lover's Online Directory! If you are looking for a cat-related website, this is a great place to start. CatToys.com I put a couple of these crinkle balls in my kitten take home kit. Pet buyers are always asking where I get the Crinkle Balls. I get them from this on line cat toy store. They are the BEST tonk toy. Here is a testimonial from Caryn. "You gave us a group of toys including a small multicolored soft ball with a crinkle foil middle. Do you happen to remember where you got it? It’s apparently the only toy that works for fetch.... Tae goes crazy for this toy but just looks sort of ho-hum at the other balls – and I’ve got every other ball." Peta wants to do away with all pet ownership and farm animals. Click on the logo and learn more.